Imagine you are a personal coach, hired to improve the live of your client. Objective 1: Get your client to work harder and deliver better results. How are you going to improve their performance? One way is to tell them what they are doing wrong at the moment, follow-up by supplying them with all the necessary information and give them the best ways to accomplish their goals. By doing these things, you hope that they will use these facts to improve their own performance. Imagine a basketball player that can't shoot 3-point shots. We could record him on video when he is playing and go over every move he makes. Then we show him video material of the best 3 point shooters in the game. We can even connect the dots be comparing him side-to-side with the top player. Next time he is practising his long distance shot, he will remember some ideas from the performance review and use them. It is very likely that his 3 pointer percentage will improve. Objective 2: Get your client to lose weight, quit smoking and start exercising. This is a bigger challenge. In most cases, your client will know what's right and what they should do. But when they need to act on it they do the reverse thing. One way to explain this is that success in these areas isn't visible enough, the benefits only show up in the long term. Spending one hour to analyse someone's basketball shooting style will improve the game almost instantly. It is harder to see the results of giving up smoking for a week. Visualizing that progress. Track the numbers and put them somewhere where you can see it. Number of kilos lost, minutes exercised, improved running speed,.. But it is harder than that. How do you get your client to actually TRY a different habit? A common approach is to REALLY convince people that being fat is bad for them. Tell them all the possible diseases they can get. But people aren't adopting healthy lifestyles en masse. They aren't abandoning cigarettes. Reading that exercising three times a week will reduce the risk of a heart attack by 100% might get you out of the house three days a week. The second week you might go twice and before you know it, the third week has gone by and you haven't done anything and you just stay at home, feeling guilty. 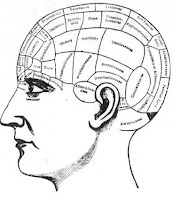 So if giving more information doesn't work, what CAN really change your behaviour? First of all: I tricked you, there is no list of 101 items waiting at the bottom. Even more: I urge you to get rid of 101 Ways To Do XYZ -lists you have got bookmarked. I know, you were going to read and implement them one day. Here is what does work: take baby steps towards your goal, find and destroy your barriers and create triggers. Now that you have your baby step, how can you make it as easy as possible to do this? What has been stopping you before? I don't have a nice park to run in. My running shoes are old and broken. Probably you can come up with a bunch of reasons. Do these barriers really matter? Can you find an easy fix for them? Now you have already got two pieces in place to really make some changes. The last piece is designing psychological triggers in your life. Things that when you see or read them, you are reminded of your goals and remind you to take action. Below is a different kind of trigger that I found. Instead of a personal coach, imagine you are Google. Objective 3: improve the performance of your software users. A small overview of how Google AdWords works is necessary, skip ahead if you got the basics nailed. An advertiser creates an ad and puts it into the system of Google. He then specifies how much he wants to pay for each click, for which keywords it should appear, to which users it should be displayed, etc. This information, together with that of all the other advertisers for those keywords is put into an algorithm which decides the ranking of the sponsored links. The quality score is a score that is based on how good the ad corresponds with the keywords and page where the user is sent after a click. In the The Case of the Missing Quality Scores, it shows how Google is using psychology for their online marketing: getting people to write better ads with a higher quality score. The author noticed that the distribution of his quality scores (ranging from 1-10) in his account had changed over time. 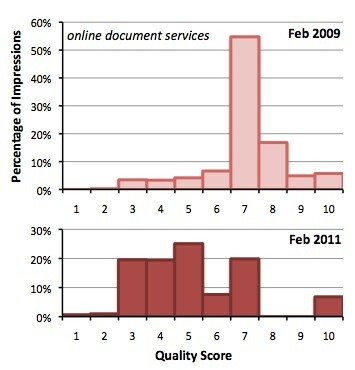 In February 2009, a score of 7 was very common and the other scores where distributed around this. Tests in 2011 showed a change in distribution. And suddenly there were almost 8 and 9 scores anymore. It would make sense to see these changes if the account was worse. But the impressions, click through rates and conversions all were up. After some more detective work the author concludes that Google is simply less generous to hand out these high quality scores. If people see that 80% of their ads score 6 or less, they know they are leaving money on the table. Quality scores affect the cost per click. A good quality score gets you the same click for less money, a bad score will cost you more. So an advertiser seeing low scores will spend more time improving their ads, increasing click throughs and conversions. And as it happens, high quality ads get more clicks, which helps Google make money. Psychology and marketing, hand in hand.